The General Electric 225 (introduced about 1960) was the first digital computer that I was paid to work on (or play with depending on your view point.) One's first computer is a bit like one's first love or dog ;-)) Here are some tales of that adventure. For about 8 years I have kept my eyes open for General Electric "Computer Department" computing equipment. Lurking about the Computer History Museum in Mountain View, California helps keep one focused and is a center of activity. The first computer manufactured by the "Department" was the "ERMA" under contract to Bank of America. The initial tube design of a fixed program machine was made by SRI (now Stanford Research Incorporated) and "modified" "by the good folks at G.E." (an advertising slogan at the time) into a transistorized general purpose computer. (It did have one very special instruction - the "tumble instruction" designed to help sorting. It had 3 or 4 operands and could well be an example of a "complex" as opposed to "RISK" instruction.) One of the original 30 machines is on display at Bank of America's private museum in Concord, CA. The next was a contract to manufacture (and provide support for) the NCR 304. Nothing further was located by anyone that I know of for five years, and several General Electric "Computer Department" reunions. 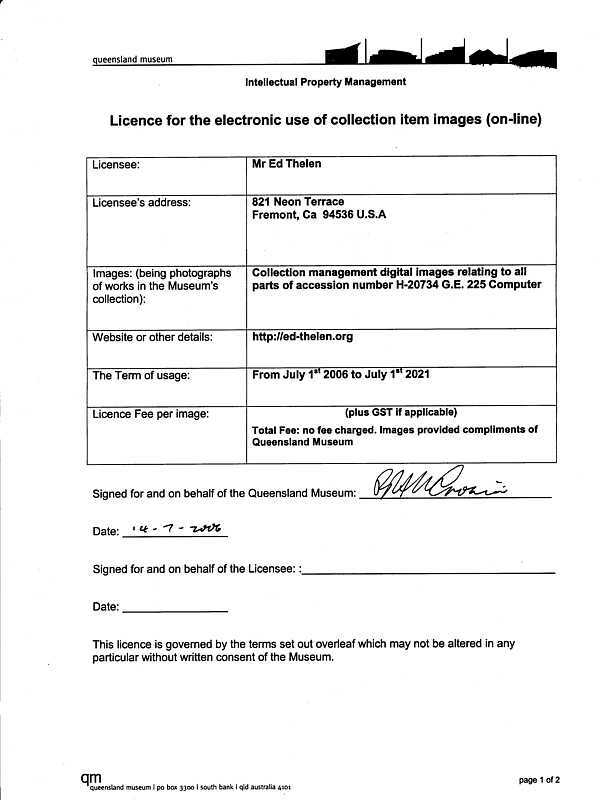 On July 6th, 2006, Peter Volk - Assistant Collection Manager of the Queensland Museum (South Brisbane, Australia, phone +61 (0)7 3840 7555) e-mailed me saying that there was a GE-225 in good condition in that institution. He asked if I could verify the identification of various components, and sent images of that machine. The web publication of these images has approval of Queensland Museum Intellectual Property Officer. 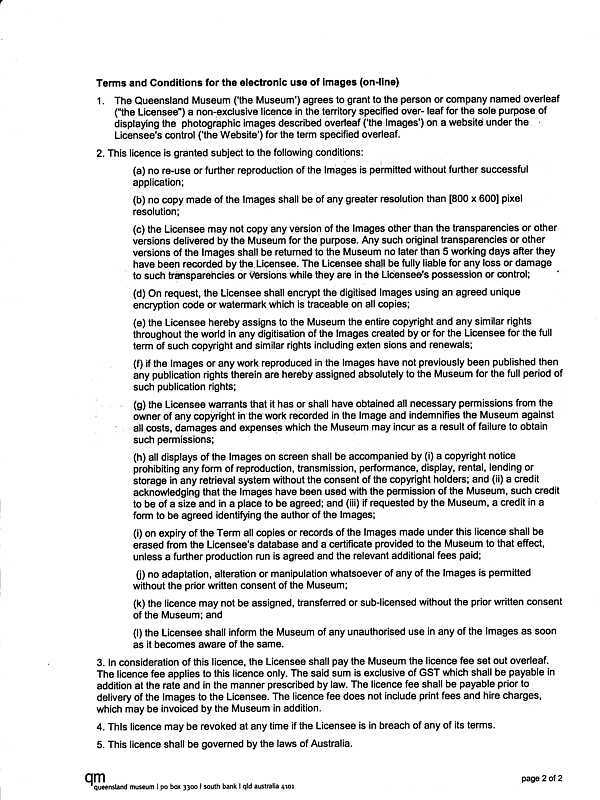 "... so long as they are clearly marked as "Copyright of the Queensland Museum. Used by permission." We won't charge you any fee, and you can't charge any fee either. Third parties who wish to also host copies will have to ask for permission separately." " One of the constraints on permission to post images publically is that we restrict the fidelity of the image to a maximum of 800 x 600 pixels. If people want a good quality photo we want them to come to us and give us money. I have resized the photos I sent you earlier and attach the permitted copies. Please make sure that you post these images, or smaller copies. This shouldn't be too much of a constraint. The larger images I sent earlier would probably be too large for a web page anyhow. The permissions run from the first of July this year, and last for 15 years." Peter Volk here, from Queensland Museum. Yes, the GE225 is still sound and safe in our collection. The 2011 floods didn’t come anywhere near it, and it has been well housed and secured. Is it for sale or exchange? In practical terms, probably not. It was the first digital computer in Queensland and is considered a significant part of the state’s history as a consequence. We value it more for that association than we do for its technical significance, though that is, in itself, considerable. We would need to be offered a really significant sum to consider parting with it, or be offered an object that had equal significance to Queensland history. If you wish to make a formal inquiry about the possibility of purchase or exchange, you should contact our museums C.E.O. Dr Suzanne Miller [e-mail address deleted] , who would forward the inquiry to staff for proper assessment and report before she replied. That report would probably require us, in turn, to contract with an accredited valuer of such objects to give us a ballpark dollar value, which would require us, first, to find such a person. The whole process between initial inquiry and final response could take a few months. The Queensland Museum is a government funded and operated museum, and is charged by Act of Parliament to collect and preserve material of significance to the history of Queensland. This means that, even if the financial offer was very, very attractive we may find ourselves unable to ethically or legally accept it. That is an assessment that would be made at a paypoint considerably above my own. If you wish to make such an inquiry I’m happy to give you what advice I can. I’m still quite grateful to you for the context and history info you provided me on the GE225’s a few years ago. Also "notes" mentions "Large box containing the Instruction Manuals for H-20734 found on top of MC8"
Planning for a large computer for Brisbane began in 1957. The G.E.225 was installed at the university in 1962, the first large computer in Qld. Last operated 16 February 1977. Data specifications received with donation. AGE was Australian General Electric. We were the Australian sales and support office for GE Computer Dpt.Phoenix AZ. The University of Queensland was the first 225 system sold in Australia. The Bank of NSW was the next customer with a 225 and two sorters. Later adding a 235 with another sorter. A photo of this site attached. Only thing left from these computers is CPU console.panel and a memory core stack. - The top thing is a big power supply. This is the front of the GE 225, with out the table, card reader and typewriter. One of the pushbuttons was "LOAD CARD" which caused the card reader to read a card image, in binary format (2 columns was one 20 bit word, 80 columns was 40 words), into memory starting at location zero, and started execution at zero. The card could be a bootstrap loader which loaded the following normal loader. The lower panel with the electric outlets is normally hidden by the desk/table. The round brown plug on the left is for the card reader - I don't know what is going on on the right. A guess would be the electric typewriter. This desk was placed in front of the Operator's Panel, and supported the Elliott card reader on the left and the IBM typewriter on the right. Images Copyright of the Queensland Museum. Used by permission. The Auxiliary Arithmetic Unit of a GE 225 system. It provided a 40 bit floating point add, subtract, multiply and divide at a much higher speed than if done by software in the GE 225 computer itself. As a point of reference, to send a floating point value to/from this unit took over 66 microseconds to fetch the load/store command from memory and fetch/store the operands to/from memory. The 20 bit wide data transmission over the cable overlapped the memory operations. Open doors - general construction - The little black plug with the little black screw handle at the lower right of the right frame is a terminating plug for the data transmission cable used to read/write data and commands to/from the AAU. this is the Magnetic Tape Controller I know is says "INST. REGISTER" and "ADDRESS REGISTER" which would influence one to think processor - But mag tape units have "instructions" such as read block, write block, rewind, write end of file mark, ... and the "address" refers to the address to DMA data to and from core memory in the processor. shows the 4 sets of control and data plugs. You could attach 4 tape drives to each side for a total of 8 tape drives. This one was a second generation, with "pucker pockets" that grey unit that looks like a grey fish eating a white fish This unit was like the long columns in say an IBM 729, but much more limited buffering capacity and a slot to a vacuum cleaner motor that created a lot of "white" (no particular frequency) noise - horrible. And the vacuum cleaner motors weren't very quiet either. For my own sanity, I bought some long vacuum cleaner hoses, and placed the vacuum cleaner motors under the raised floor. Those long light colored arms that could swing down on top of the tape in the reel were called "tape packing arms". These attempted to keep the tape from wrinkling between layers as the large torque motors (not seen) started and stopped the reels as fast as practical. I think it was a desperate attempt to "do something, anything". Designed to spec written by someone who knew nothing of the realities of printing business forms. The top part was made by Analex - from outside of Boston somewhere - actually for a drum printer it wasn't all bad. It went fast, and if you weren't too fussy about wavy print, or the F.E. adjusted it on a weekly basis, made acceptable print. The bottom part is hammer driver cards and the brown thing is the power supply for the hammers. 'GENERAL ELECTRIC - GE468. GE PT 12A 8466 P1. So this machine seems to be an IBM 523, and this image may just be the best of an IBM 523 on the web. In any case, the IBM 523 was extremely reliable - the most trouble free peripheral (by far) in the GE 225 system. The GE instructors basically said - "This 523 works well. We have shown you the GE drive circuits for the punch magnets and clutches, and this is the big grey ugly 'shoe connector' to the machine, that is all you need to know. OH yes, don't forget the 80-80 plug panel!" Well, OK, every week or so the operator had to empty the "chad bucket" or there would be a mess. Lots of twisted pairs to conduct lots of signals with a limited amount of noise and cross talk. Not very glamorous, but they do the job of - well - what? Sitting the floor? Under the blue computer boxes? You serious?? but I don't remember seeing one all prettied up with skins like this. Maybe some came this way, but soon the continual maintenance and tweeking and jam clearing made keeping the skins on impractical? For a less polite discussion of this little devil, click here. The little grey assembly with yellow and red wires is likely the array of 12 lights to send light through card holes to an array of 12 photosensors below the moving card. For some reason this assembly was removed from it's place just before the top feed roll? The 12 volts lights were not driven hard (maybe 9 volts) and "never" failed. Hole sensing was almost the only thing on this machine that worked reasonably well. In any case, the upper part is the input hopper, not visible in the seemingly 2.5 pound cast iron block with handle that pressed the cards down against the bottom plate that - oh - you don't want to know - Also wrapped about the input hopper is the connecting cable. In any case, the metal gadgetry nearest you is the exit of the cards into the output hopper discussed (or cussed) below. That funny little gray finger thing is several layers of feeler gage stock, maybe 0.002 inch thick, whose purpose is to push the cards flying out of this machine into the output hopper in an orderly fashion. F.E.s and operators diddled this screw so much that the little threads failed - and more robust nuts and screws were substituted. It was easy to despise this machine. What a pile of poop! This card reader was, I feel, one of the main reasons that the only customer that re-ordered General Electric Computer Department equipment was the U.S. Army (Huntsville) - and they were using mostly paper tape in their Saturn data logging application. The G.E. marketeers and salesmen, to this day, refuse to admit that an almost zero re-order rate had anything to do with the failure of the G.E. Computer Department. They just smile and blather on about financing machines. This is the back side (the other side from the operator) of the infamous Elliott Card Reader Output Hopper. Dear Friends - there should be a special place in Hell for who ever designed this part of the nightmare card reader. To get cards out of this hopper, the operator pulled on the little handle on the other side. As the operator pulled this little tray out, the triangle thing you see would be pulled out to 90 degrees from its present position, and try to catch the cards falling down into this output hopper, making a temporary bottom to the hopper while the output drawer was pulled out. When the operator pushed the drawer in again, this temporary bottom would disappear, permitting the cards that had dropped on the top of this little flap to fall to the bottom of the drawer. If the above is confusing and weird - you are correct. Horrible things could happen until you got the knack of it. and they were against you if they were not new or were warped! You were well advised to stop the computer while you removed cards from the Elliott !!! A write only typewriter from IBM - the keyboard could not be read by the computer. Yes - it worked :-)) Enough to give you an inferiority complex. If a unit was designed or made by G.E. Computer Department, you had a lot of trouble with it. If it was made by someone else (except the Elliott card reader!!) it worked better. The one I played with (and chopped capacitors out of) had two reels - I don't understand all that sheet metal and drawer looking thing below the tape deck. Paper tape, technology was well in hand, worked well, even the paper tape punch on the right hand side from Teletype Corp. The circuit cards to the left (also called "boards") are the technology of about 1960. Each little round can houses one transistor. The right hand side is the "bottom" side. The density of discrete components per square inch increased each year as manufacturing technology permitted. In 1964, IBM introduced a hybrid which was a ceramic carrier about 3/4" x 3/4" with about 16 connector pins projecting out of the bottom and multiple chips bonded to the top - covered with protective gell and cap, each chip being one transistor. By 1970 the above was obsolete as "dual inline packages" "DIP" with actual integrated circuits took over. Sizes of significant computing have decreased from - small room (UNIVAC 1950), several refrigerators (1960), 1 refrigerator (1970), desk top (1980), ... with each 10 years yielding more than 10x faster speed and 10x increased memory and 5x decrease in price.